Most dentists will agree that controlling saliva and moisture during dental procedures is essential, but not always easy. “Keeping a dry field is very important in a modern dental practice, and sometimes is a real challenge,” Dr. James DeFilippo told Dental Product Shopper. With so many moisture control products available— from cotton rolls to traditional dry angles to suction devices—how does a dentist choose an effective and efficient product? 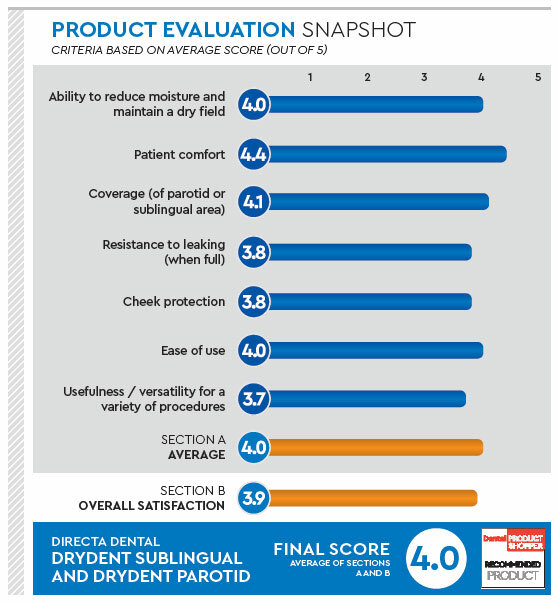 For DeFilippo and more than a dozen other dentists, one way to find out was to evaluate Directa’s DryDent over several weeks for this DPS product evaluation. Available in large and small sizes, DryDent Parotid is placed directly over the open ducts of the parotid gland where saliva is optimally absorbed. Placed under the tongue and also offered in 2 sizes, DryDent Sublingual is a unique product that collects and controls the saliva produced by the sublingual glands as well as the submandibular glands. DryDent is designed to keep moisture under control, even when fully saturated, according to Directa. Dr. DeFilippo observed, “It absorbs saliva well and resists leaking when saturated,” while Dr. Lisa Cohoe felt that it became full too quickly and needed to be changed too often. A couple doctors recommended a larger size, while Dr. Dater suggested a smaller size for pedo. Made of smooth soft materials for maximum patient comfort, DryDent is flexible and very easy to remove, according to Dr. Beatty. He said he could remove it without soaking it in water and was impressed that no residual layer was left on the mucosa. “I loved the flexibility of the parotid angles,” shared Dr. Clark, adding that they work very well and are comfortable for the patient. 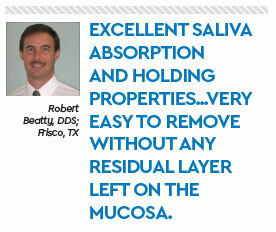 Several dentists, including Dr. Cohoe, Dr. Noonan, and Dr. Mark Edington, said their favorite feature was the softness. 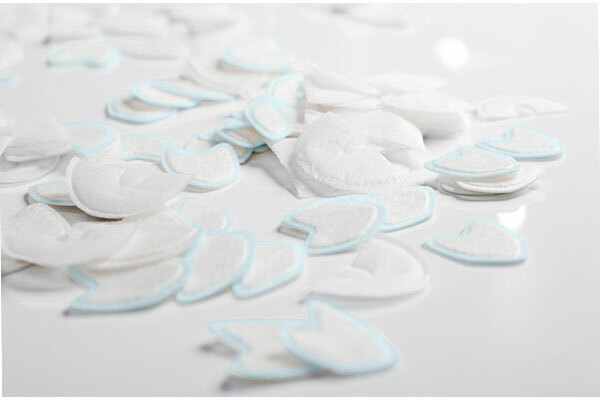 “The softness of the product was great for sealants compared to [another product] that sometimes cut into the tissue,” shared Dr. Kari Haganman. Regarding patient comfort, doctors commented that it did not cause irritation to the tongue and cheek when using suction, and that it worked well as a cheek protector when using a handpiece. Another dentist said the product is very thin and unobtrusive, and that patients may have been unaware of its presence. Rating his overall satisfaction as excellent, Dr. Jetter shared, “We appreciate any product which helps procedures go smoothly, and this product is certainly one of those.” He added, “I cannot think of any way that it could be improved.” Calling it a good product that delivers as promised, Dr. Tony Storace said he most appreciated its ease of use and universal application. He noted that his hygiene staff and assistants also liked the product. “And if they are happy, the doctors are happy,” Dr. Storace concluded.